Good vs Evil, is it that Simple!! Good vs. Evil, positive vs. negative. What if it’s not that simple, what if it’s more nuanced? In my latest quest to understand myself better and where I am, I found myself looking for the perfect time to make a change. I started to really evaluate the story I was telling myself. For some time now I’ve been writing about my struggle to get a grip on what my career path should be. I felt that I was making really great progress in my personal life, in figuring out who I am, and what my purpose is in life. I think part of why I’m struggling is because I don’t feel like I’m on the right career path. However there is something meaningful about being aware. I do recognize that there is an ideal place I’d like to be, now all I have to do is work on getting there. As intriguing as that is, it’s not the reason I’m writing this. I was reading a post about someone else who was struggling with making sense of their life, and they got me thinking. There is something out there called “The Law of Attraction” I’m not going to get into why that shouldn’t be your only philosophy, but it made me think of playing opposites against each other. 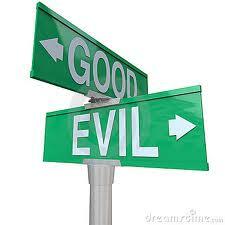 We hear about good and evil, positive and negative, but is it always that simple? Do bad things happen to good people, and good things happen to bad people? Of course we have many occurrences of that in the world, so then it’s probably a bit more nuanced than just black and white, there may be a grey area if you will. Things are also cyclical. I wont say that I’m in the Triumph stage of my life, nor am I in the Trials stage; it feels more like something in the middle. I’m discovering myself, and building a strong foundation for what comes next, good or bad. So if life is cyclical the good prepares you for the bad; gives you something to look forward to when things are bad. The bad also helps build you up; you’re more humbled when things are good. I read of a story today of someone who found out she had cancer, but that was only the beginning of the story. What her illness thought her is that there is a lot of love in the world, if you embrace love, it will embrace you. That made me think of my own mortality, I’m building myself up right now, but can I actually stand on that when it counts? That was scary to think about, but that story thought me a valuable lesson. Things happen in cycles, and where you are in the cycle depends on your state of mind. When things are not ideal, I can either choose to let it keep me down, or I can use that as an opportunity to triumph. Finding out you have Cancer sounds like it would be the trial stage for me, but what the writer thought me is that it could also be the beginning of the triumph stage. This story also goes back to life being cyclical. She was really embracing love and speaking of it’s merits just a few days before that devastating news, but that prepared her for the next stage. There is one big error people fool themselves into believing though, if I stay positive, things will always stay that way. As you see from the earlier example, practicing being Loving doesn’t stop you from getting cancer, but it does change the way you think of your illness though. Life is a journey, there’s good times, bad times, and sometimes it’s somewhere in the middle. Don’t get caught up in “… and then” thinking. Meaning don’t get in the habit of thinking things like “I’ll wait until work slows down, and then I’ll take a day off” or “I’ll wait until I get that promotion, and then I’ll be happy.” The problem is that the majority of times you get to the goal, and a new one arises, so you never can quite accomplish your goal. I heard a great saying a few days ago, “don’t get caught up focusing on the goal, it’s in the journey that you discover yourself.” Now I’m not saying don’t plan or make goals, but what I am saying is take time to enjoy the journey. Remember life is cyclical, so although you may never quite reach the goal because the cycle starts over, you would have at least learnt somethings along the way. I guess the old “stop and smell the roses” quote really does make sense. I say this because I find myself in a similar situation. I know that my current career path isn’t fulfilling, and many options have been presented to me. Although there’s times when you need to wait and be patient, sometimes you just need to take a step. Just as life is cyclical, opportunities will always present themselves to you. You just have to take the ones that feels right in your heart; as long as your heart and mind are aligned you’ll make the best decision. I was getting caught up in waiting until things are perfect, and part of it was also fear, what if I’ve made the wrong decision? For most people fear alone is enough not to ever move, to never take that leap of faith. There is one thing I know, when you follow your heart, you will always move in the direction you’re destined to go. There might not be a perfect path, there will be one that is more ideal or less ideal. Which ever path you choose, it still takes you in the right direction. Lastly what does Destiny mean, is it some predestined path that you’re bound to be on regardless of what you do? I choose to replace destiny with purpose, I feel that there is one thing that I’ll do best in life. My goal is to live with intention, to move in a direction that takes me towards that purpose, one step at a time. Life is full of choices, everyday we make choices, what clothes to wear, what route to take, what mood we’re going to be in (or what mood we’re going to be in after interacting with someone). I choose to believe that life has many choices. By choosing to believe that I have a choice, I’m choosing how I what my life to be like today. There is an exercise a Professor made us do in one of my Psychology classes that’s really helpful. He made us imagine that we were at our own funeral, then ask the question, what would you like people to say about you? Now we’re not talking about the “nice” things people say. If they could say how they really felt, what would they say about you? As daunting as that thought was, it helped with the point about living with intention. The decisions you make today, should be a reflection of how you wanted people to see you in that vulnerable time. When it comes to destiny, whether you’re religious or not, what is destiny? Is it a list of demands you have and you say, universe/god here’s what I want for my life, make it happen. Or is it, here’s what I want my life to be, if it’s in my best interest/if it’s your will god. I think this is where many of us get caught up. There is a best purpose for your life, a place where you will be the best to society and those around you, then there is the place where you think you should be. Since many of us make a lot of bad choices instead of living with intention. If it was just up to us, we would be selfish and just do what we want. But life and living is more than just what we want for ourselves, its about what we ALL can do to make each other’s lives better. So what’s the take away, life isn’t as simple as good and evil, or positive and negative. There are many areas that dwell in the grey spaces. Life is about making choices that put us on a path of living for our purpose. Live each day and enjoy the challenges that come your way, we can either triumph, or our trials can be an opportunity to triumph. Whether you’re in the triumph stage, the trial stage, or some place in between, neither lasts forever. Here’s a simple prayer I’ve learnt about, and I think it helps whether you’re religious or not, it helps to live with intention.